Gum disease is quite common but it can have devastating consequences to your mouth as well as a person’s overall health if it is left untreated. Tooth loss is a common occurrence that is associated with periodontal disease as well as increased gum soreness when it is ignored. In addition with each stage of this condition, a different periodontal treatment may be recommended. Most people experience some type of plaque buildup over a period of time. When bacteria and saliva in your mouth line your teeth the proces of plaque buildup occurs. As you eat, food particles stick to your teeth and create plaque. Bacteria thrives on this material, which can lead to gum disease and other oral problems, especially when it is allowed to grow. 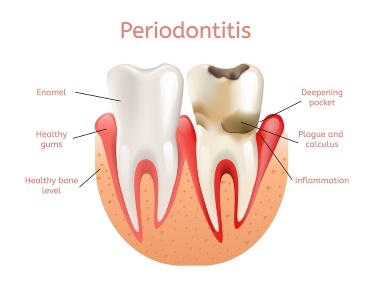 When periodontal disease begins, gum tissue gets loose, and pockets form around teeth. These crevices fill with plaque. Treatment will depend on the depth of these pockets. Tooth Scaling. When gum disease is uncovered at its earliest stages, dental scaling will be used to clean your gums. Using a special instrument, your dentist will remove tartar and plaque from your teeth so that your gums regain their health. Deep – Plane Scaling. When periodontal disease has reached more serious levels, deep-scaling may be necessary to return gums to a healthy state. Since this method cleans deep below the gum line and toward the roots of your teeth, your dentist may numb your mouth. If periodontal disease is extremely advanced, surgery may be necessary to close deep pockets and to regenerate lost bone. After scaling, your mouth may be a bit sore. Even though your gums may be uncomfortable, it is essential to brush and floss regularly. This keeps plaque from reforming. It is advised to use a toothpaste made especially for sensitive teeth. Rinsing with mouthwash will keep gums clean as well. After your scaling treatment, your dentist may schedule a follow-up visit to check your gums and to make sure that everything is healing properly. Approximately half of American adults suffer with gum disease. Scaling is a common treatment. Dr. Jade Thomas at Banyan Dental will make sure that all plaque is removed from above and below your gum line so that your complete oral health is restored. To schedule a visit, call our office today.